Losing iPhone Contacts may be a common accident happened in our daily life. Are you feel painful when you lost these important contacts? Do you want to recover contacts back to device? Don’t worry! Here is a good news for you. iFonebox, the professional ios data recovery tool,which could help Apple users to recover lost photos, messages, contacts, notes, etc, has added the function of transfer contacts to device in the the updated version 1.4.1.0. You may have some questions about the updated version. Never mind, we will answer these questions below. Q: What iFonebox can do? A: This powerful software is able to recover data from iPhone, iPad and iPod Touch in two methods. The first is to recover data directly from the iOS device and the other is to retrieve data from iTunes backup. When scanning directly from the device, it can recover Contacts, Messages, Call history, Notes, Calendar, Reminders and Safari bookmarks; while from iTunes backup, it is able to restore Camera Roll, Photo Stream, Contacts, Messages, Message attachments, Call history, Calendar, Notes, Reminder, Voice memos, Safari bookmark. Q: What’s new in the updated version? A: The key feature of this update is add the function of recovering Contacts to device. Besides, we also did some optimization like optimized the efficiency of loading images, repaired the function of recovering data selectively, optimized the extraction of recovered data and fixed some known bugs. Q: Is iFonebox suitable for any iOS devices? A: iFonebox is suitable for almost all iPhone, iPad, iPod Touch including iPhone 3GS/4/4s/5/5c/5s, iPad 1/2/3/4/iPad Air/iPad mini/iPad mini 2, iPod touch 4/5. Q: Where to download iFonebox? Q: How could I transfer Contacts to device? A: Please read this article to learn the detailed way to recover contacts to device. Q: When will the updated version of Mac come out? A: The updated version of Mac version will come out in few days. Please wait patiently. Any other questions about iFonebox and iOS devices, you could contact ifonebox@auntec.com for further help. They have professional support team to help you. 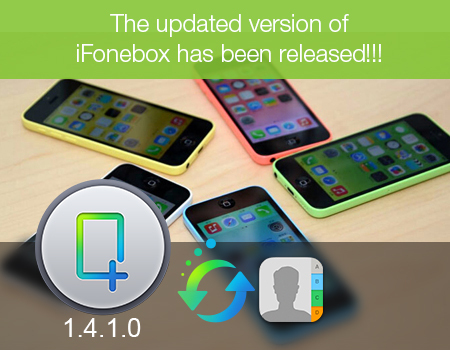 Just have fun with the updated iFonebox!